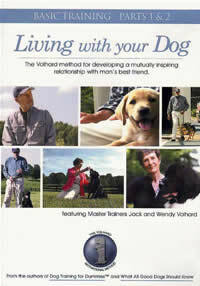 This 2 disc DVD, released from Jack and Wendy Volhard, features their patented Motivational Method™ of training. All essential progressions of their method are covered in addition to practical, everyday applications of the obedience exercises, helpful training tips, Jack's sage advice, and a special section on holistic nutritional options. Living with your Dog advocates positive reinforcement as the most effective teaching tool. Sit, Stand, Down, The Sit Stay, The Recall Game, Equipment, Crate Training, Puppy Development, Touch, The Long Down, Door Manners, Leash Manners, Jumping Up, Grooming, Nutrition, Leave It.